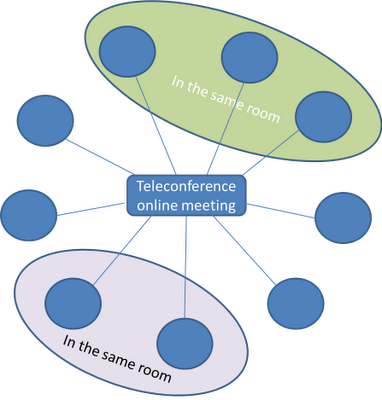 I've been in big companies for long enough to have quite good understanding how teleconferences really work. The idea is the same than in face to face meetings, people get together for a reason or another and discuss their way forward. But teleconferences have so many other additional aspects compared to f2f meetings, that you should be aware of those when participating one. Here's a basic setup for a teleconference. People phone in with their mobile phones, computers or teleconference phones. Quite often there is also online presence so people can actually see the same presentation in their screens if they are with computer. At first it seems to be quite the same as face to face meeting, where people would all be together in the same room. In reality the picture below might look like more realistic setup. There's three people in the same green room, two people in other location in the grey room and rest are individually located in different places. People in the same room will actually have their own co-operation and discussions ongoing during the meeting. This happens even without words, since people communicate so much with only gestures. Most often there is also real discussions ongoing in these rooms either concerning the meeting subjects or not. But that's not all. 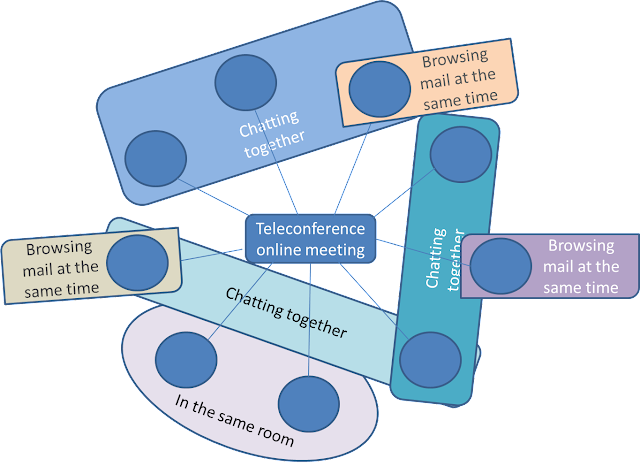 There's actually way more communications ongoing in teleconferences than there would have ever been in face to face meetings. 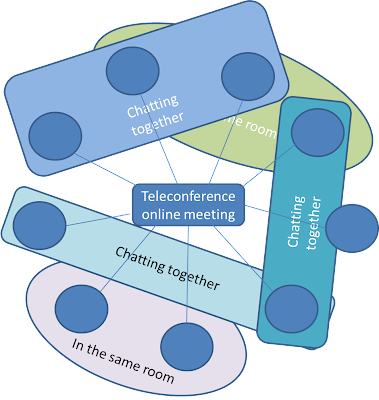 When people are sitting with computers, there's possibility to chat with others even they are not in the same location as you are. This possibility wouldn't be there for f2f meetings. It gives a different twist for discussions, because people can co-operate more on the background. Responses and issues raised might be result of communication already happened and not raised first time for discussion as spoken once. That makes it easier to raise concerns, when people have backed up their items with checking with some other participants in the teleconference. 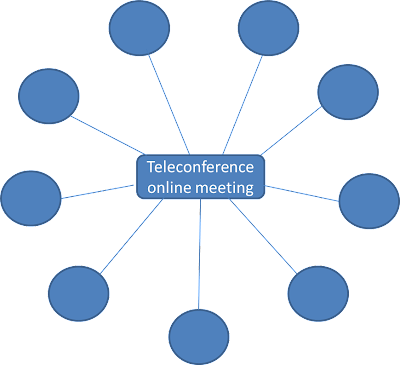 Still there's lot more on teleconferences than just the communication happening for the meeting subject. When people are busy, alone with the computer and in a meeting, there's a strong temptation to do other things at the same time. Many people do check their mails or RSS feeds during these meetings. And some might even check the social media for latest happenings. Meeting subject will not get full attention from all the people in the meeting all the time. That just never happens. You can't prevent people on doing these things at teleconferences. This is the nature of teleconference. There's lot of good on it also. People often hate meetings and quite often for a reason. Online teleconference is a half of a meeting. It saves time from people not needing to travel and not needing to pay full attention. This all comes with a price, because not having a full attention, just means that meeting results might not be as good as with face to face meeting. That's the balance you need to consider when running a teleconference and not face to face meeting. Teleconferences and online meetings are not that bad. It's just good to realize how those actually work to understand how to make most out of those.